According to the latest data from the Centers for Disease Control and Prevention (CDC), roughly 9.3% of all Americans have diabetes. That’s over 29 million people! Over the years, my team and I have devoted ourselves to creating materials that can help you help people manage diabetes in a healthful way, and today I want to draw your attention to one resource in particular. The Gold Member PowerPoint Archive. Today, because of those crazy statistics, I want to offer a sneak peek into one of our most popular diabetes presentations. If you like what you see, consider a membership today! This show is comprehensive, beginning by addressing the causes of and statistics about gestational diabetes, type 1 diabetes, and type 2 diabetes. 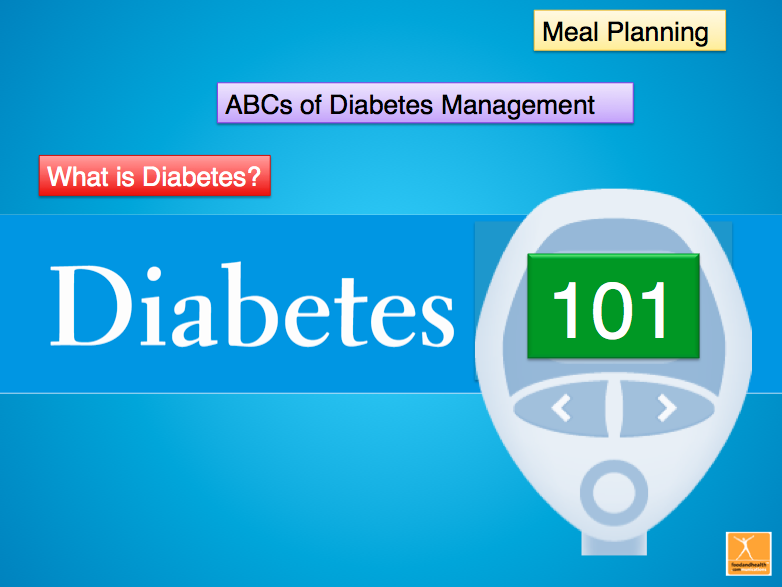 It then covers common diabetes vocabulary words — everything from insulin to pancreas — before diving into the ABCs of diabetes management. The show ends with an exploration of meal planning with diabetes, and this exploration is as comprehensive as the rest of the presentation, addressing carbohydrate counting, protein servings, types of fat, and the importance of fiber. 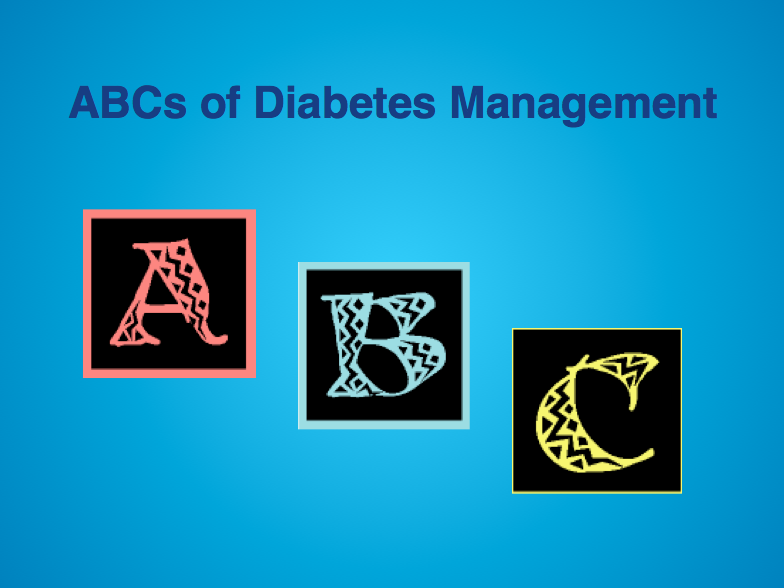 Today we’re going to take an abbreviated look at the ABCs of diabetes management. When it comes to successfully managing your diabetes and staying healthy, it’s important to remember your ABCs. In this case, A stands for A1C, B stands for blood pressure, and C stands for cholesterol levels. Let’s explore each one in more detail, shall we? 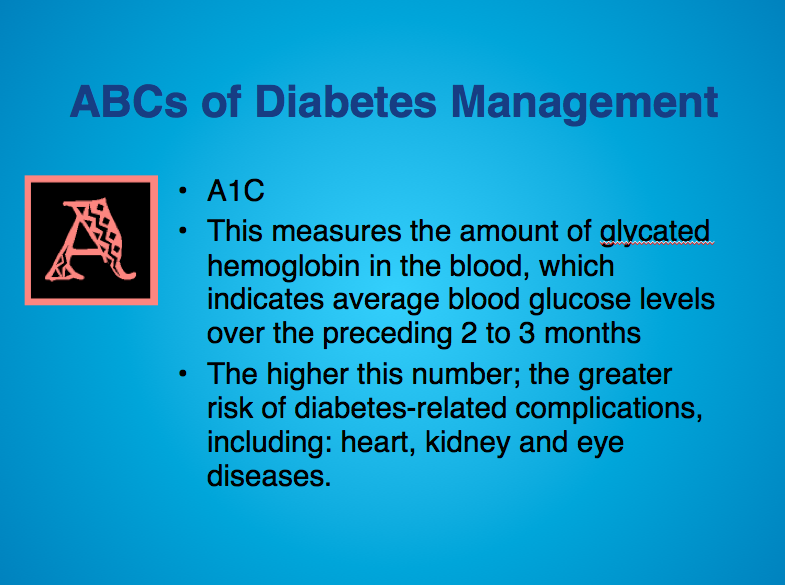 A1C is the “A” of diabetes management, and it’s a measure of the amount of glycated hemoglobin in the blood… So why on earth should this matter to you? Well, this number is a good indication of your blood glucose levels over the past few months. When it comes to interpreting this measurement, you should know that the higher the number is, the greater your risk is of having some kind of diabetes-related complication. This could affect your heart, kidneys, or eyes! 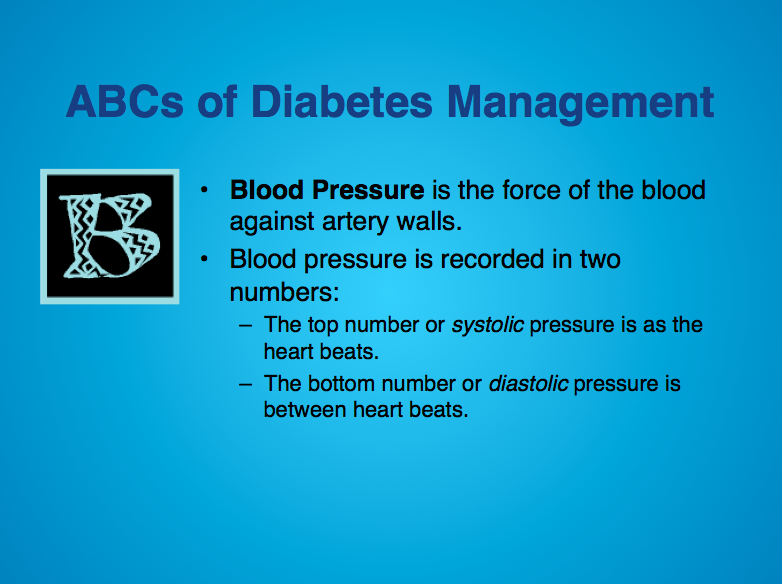 The “B” of diabetes management is blood pressure. Do you know what your numbers are? Blood pressure is a measure of the force your blood exerts against your artery walls. It’s recorded in two numbers, which are then stacked on top of each other. The top number is your systolic pressure. That’s the measure of the force on your artery walls when your heart beats. The bottom number is called diastolic pressure, and that’s the force on your artery walls between heartbeats. Blood pressure is important for everyone, but it’s especially important if you have diabetes because having diabetes raises your risk of heart disease. The American Diabetes Association recommends that people with diabetes keep their blood pressure below 140/90 (source) but less is better of course! 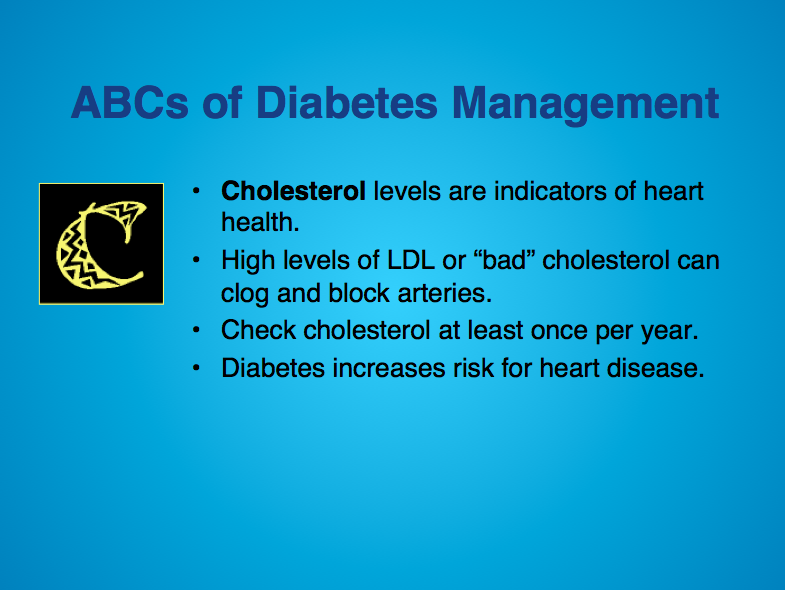 Cholesterol is the third part of the ABCs of diabetes. Like blood pressure, your cholesterol levels are indicators of heart health. It’s wise to get your cholesterol checked at least once a year. When you get those levels checked, you’ll likely learn about your triglycerides, HDL (“good”) cholesterol levels, LDL (“bad”) cholesterol levels, and total cholesterol levels. Let’s take a look at each of these in more detail, shall we? I’m afraid we’re going to end on a cliffhanger here. I had to eliminate a few slides with more details for each of the letters in this section in order to fit the parameters of a “sneak peek,” but there’s an idea of what you can get as a gold member of the Food and Health family! I hope you enjoyed it and that it will be useful to your clients. Diabetes Banner 48" X 36"